The revelation comes just in time for Cleo’s upcoming appearance on VH1’s The Surreal Life 7. I just wonder if this means we’ll be seeing any hot girl-on-girl action between Miss Cleo and some of her female co-“stars” on the show. French kisses between Miss Cleo and Cassandra “Elvira” Peterson? Fondling in the hot tub between Cleo and V.I.C.I. the Robot from the TV show Small Wonder? Maybe Cleo will even get a follow-up series just like Christopher Knight and Adrian Curry got. This could be the best season of The Surreal Life ever! 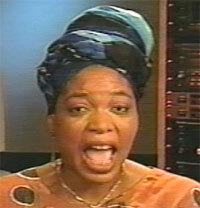 By the way, in that article in The Advocate where Cleo comes out of the closet, author Greg Hernandez describes Miss Cleo as “Wearing her trademark headdress, colorful robes, and chunky jewelry on the infomercials…” In my review of the Miss Cleo infomercial I wrote “…it’s hard to imagine Miss Cleo without her trademark headdress, colorful robe, and chunky jewelry.” What an amazing coincidence that we both described Miss Cleo’s wardrobe using the exact same words!